The star tenor and his operetta heroes. 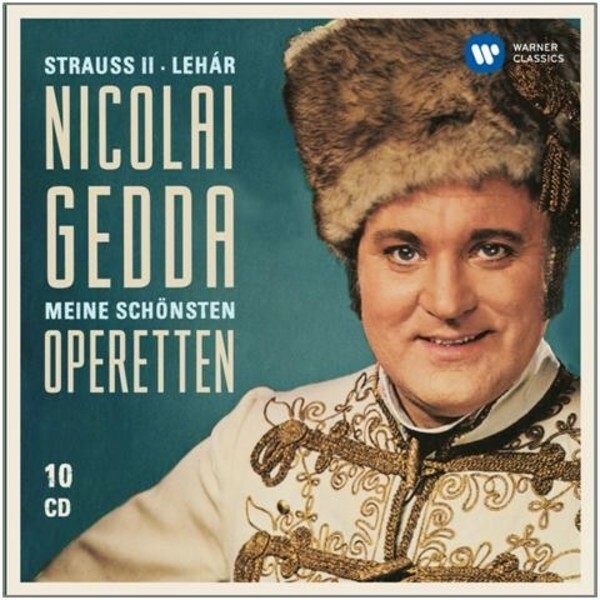 These legendary releases on the former Electrola label document Nicolai Gedda�s incomparable artistry as an operetta singer and have long enjoyed the status of benchmark recordings. Appearing alongside such famous singers as Anneliese Rothenberger, Grace Bumbry, Rita Streich and Lucia Popp, Gedda made a number of exclusive recordings in the 1960s and 1970s, working under conductors of the eminence of Willi Boskovsky and Willy Mattes and preserving for posterity his acclaimed performances in the principal tenor roles in Leh�r�s Paganini, Der Zarewitsch, Der Graf von Luxemburg and Das Land des L�chelns as well as Johann Strauߒs Der Zigeunerbaron. If operettas are now enjoying a revival after decades of neglect, then this is due not least to artists such as Nicolai Gedda. The present album brings together five complete recordings showcasing the tenor in his finest operetta roles.